The rowing machine is used to simulate the action of watercraft rowing for the purpose of exercise or training for rowing. 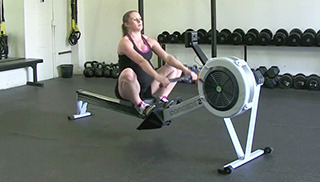 Indoor rowing primarily works the cardiovascular systems with workouts varying in distance and time. 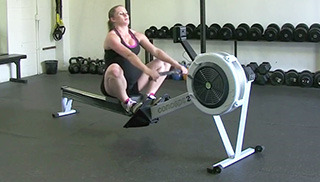 Start in a seated position on the rower while holding the handle in your hands. Make sure you start with your shoulders in front of your hips. Pull on the cable at the same time you extend through your hips and knees. Finish the pull fully extended with the handle at mid tummy and your shoulders behind your hips. Extend your arms, lean forward and return the handle to the start position making sure the seat and handle are moving in unison the entire time.